The Samsung Galaxy Tab 7.7 comes in a paperboard box that's barely wider than the tablet itself. It holds the charger, a USB cable and a 3.5mm in-ear headset with integrated microphone, call and volume controls. There is also a pack of extra ear buds. So, the only 7.7" tablet in the world doesn't have to try hard to stand out, does it? Well, actually size alone won't help you spot it in a bunch of seven-inchers. The Galaxy Tab 7.7 is barely bigger than any of the 7" Samsung slates and almost the same size as the BlackBerry Playbook - only much slimmer. And the second generation of Samsung Galaxy tablets is doing the Galaxy Tab 7.7 a favor by bringing only minor changes to the uniform design. It's a nice position to be in - we're looking at a tablet that's, in more than one way, one of a kind. Slim profile, brushed aluminum finish and Super AMOLED Plus, the Galaxy Tab 7.7 is one of the sexiest tablets around. And yet, despite all the superlatives it deserves, the design won't be the Galaxy Tab 7.7 key selling point. That role is most certainly reserved for its 7.7" Super AMOLED Plus screen of WXGA resolution (1280 x 800 pixels). There is nothing special about the resolution and some 7" tablets like the Huawei MediPad and the Toshiba Thrive 7 even push the pixel density above 200 ppi. If you did the math already, you'd know the Galaxy Tab 7.7 is close behind at 196 ppi. The Retina display of the new iPad is the standard-setter in tablets at 264 ppi. But if the spectacular image quality of Super AMOLED Plus displays is a must, the Galaxy Tab 7.7 has no alternatives. Except this little gem here we stumbled upon at the MWC. But well, we're yet to hear anything about the timeframe, let alone an expected release date. There's no need really to go at lengths about the image quality of the AMOLED screen. The deep blacks, infinite contrast, color saturation and outdoor visibility are giving LCD screens something to aspire to. The viewing angles of the Galaxy Tab 7.7 are impressive, with almost no loss of color unless the screen is viewed at extreme angles. No other tablet screen can even come close to that. Now, some tablets have zoomed ahead on resolution and 1080p screens are no longer a thing of the future. The new iPad's Retina display was a real eye-opener and the likes of the 10" Huawei MediaPad and some of the Asus Transformers are not far behind. The Galaxy Tab 7.7 will have to admit defeat or take the fight outside. That's where the Super AMOLED Plus is certainly in its element. The 2048 x 1536 screen of the new iPad is beautifully, remarkably crisp. It's the sharpest you can get on a tablet - and likely to stay so for a while - but its outdoor performance is average at best and that's a major disappointment for a display of such quality. The Super AMOLED Plus screen of the Galaxy Tab 7.7 is incomparably better outdoors. This may not be such a big deal if you tend to mostly use your tablet inside. But the Tab 7.7 makes a case for itself as the compact and portable alternative. Nothing could've given it a bigger boost than an AMOLED display. The Galaxy Tab 7.7, just like the rest of the Android gang, has very few hardware controls. With all the navigation done on the screen itself, there's no need for hardware buttons on the front panel. All you get there is the earpiece and the video-call camera. 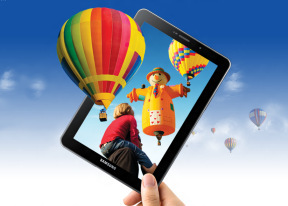 Unlike the Galaxy Tab 8.9 and the Galaxy Tab 10.1, the Galaxy Tab 7.7 is designed with portrait use in mind. When you hold it that way the earpiece goes on top where it belongs, while the Samsung logo can be read without tilting your head. Of course four-way screen rotation lets you use the tablet however you like, but portrait seems to be the default orientation. The downside is you don't have a choice if you want to use the original Samsung Keyboard Dock. The charging/docking port is on a short side. The stereo speakers are at the bottom, which isn't the best possible placement either. The other things to note there are the mouthpiece and the Samsung proprietary port that's used for charging, computer connections and providing HD TV-out. Both the TV-out and USB host features require adapters to work and they are not part of the standard package. There's another microphone pinhole and a 3.5mm audio jack on top of the Galaxy Tab 7.7. The left side features the microSD card slot and the SIM compartment, both sealed with plastic lids. The memory card slot lets you expand the inbuilt memory by up to 32GB making the cheapest 16GB version of the device a perfectly viable option. The right side of the Samsung Galaxy Tab 7.7 has only two hardware keys - the volume rocker and the power/lock key. Samsung have decided to get rid of the Infrared port, which we saw in our preview unit. The Samsung Galaxy 7.0 Plus has an infrared port and the Peel Smart Remote app preloaded. We complete our hardware inspection at the back where we find the lens of the 3.15 MP 720p-video-enabled camera. Tablets are hardly the most comfortable devices for taking pictures (even relatively compact ones like the Galaxy Tab 7.7) so the camera is more of an accessory than an essential feature. That's why we've no reason to frown at the specs - it's as good as most users will need anyway. The tablet is powered by a 5100 mAh battery which, coupled with the power-efficient AMOLED screen, is more than enough to make the Galaxy Tab 7.7 one of the best tablets in terms of battery backup. 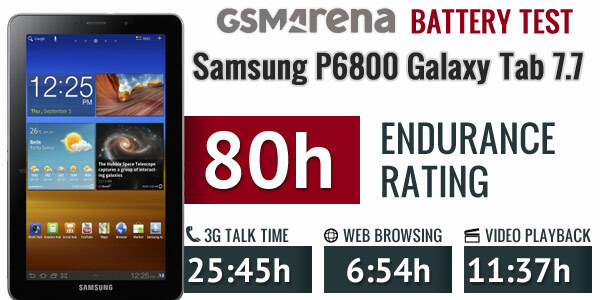 In our battery test the Galaxy Tab 7.7 achieved a score of 80 hours. This means that if you use your device for an hour each of phone calls, web browsing, and video playback every day, you will have to recharge it every 80 hours. The battery is non-removable, but that's par for the course for tablets these days. The Galaxy Tab 7.7 is impeccably built and the finish does well to set it apart from the rest of the Samsung tablets. And you really have hold it in your hand to appreciate how slim and lightweight this slate is. Portability is a key selling point of the Tab 7.7 but good looks and premium feel were not overlooked. The aluminum finish and the only AMOLED screen in business give it all the exclusivity it needs.